Twitter released its live-streaming mobile app, Periscope, today, and media, agency and brand players agree it's well positioned to challenge South by Southwest darling Meerkat. Meerkat made waves at the Austin, Texas, festival this month, picking up hundreds of thousands of users and becoming entangled in a brouhaha with Twitter. "Meerkat smashed SXSW, and brought social livestreaming center stage in the new-media revolution," said Julian March, svp of editorial and innovation at NBC News, which is already using Periscope and Meerkat. "Having played with Periscope, however, I found it dialed up the real-time social interaction—picking up Meerkat's ball and running with it." So is Periscope a Meerkat killer? We asked The Verge, which employed the app for a demo comparing the Galaxy S6 and S6 Edge smartphones. The video brought in more than 400 live viewers. "Right now, we definitely like Periscope better," said Sam Sheffer, social media manager at The Verge. "The main difference between Meerkat and Periscope is that Periscope broadcasts can be watched for up to 24 hours after they end. Oftentimes, you'd open a Meerkat only to find a dead stream with no way of replaying it. We were hesitant to Meerkat from our Twitter account because of the lack of replays. Dead streams are bad." Matt Wurst, vp and social media manager at 360i, weighed in on the question: "Livestreaming as a content experience is still in its infancy. That said, Periscope is more developed and further along in terms of available features and usability than Meerkat. It is far too early to tell if Meerkat will survive, but Periscope has a well-established network of content creators, curators and consumers thanks to Twitter." Earlier this month, Twitter spent a reported $100 million on Periscope—a startup with a purpose almost identical to Meerkat—to stream social clips in real time. The main difference between the two is that after someone stops filming via Periscope, the video can be seen up to 24 hours later. Conversely, Meerkat's clips disappear, unless you download an additional app to work around that feature. 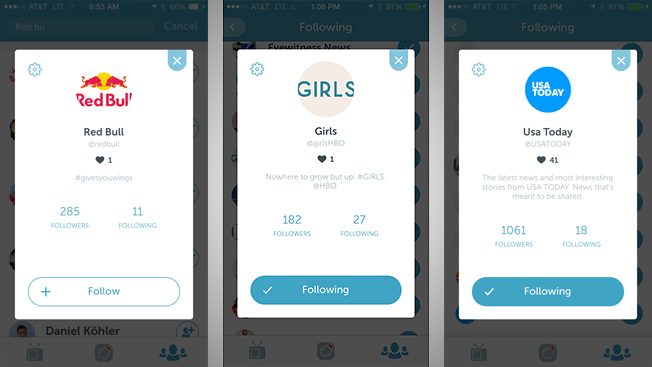 Periscope users can also "like" videos by clicking on virtual hearts, similar to the way people favor Instagram photos and videos. Currently, there isn't a similar function on Meerkat. Brands like Red Bull and HBO are already on Periscope, as are a number of news publishers including NBC's Today Show, Huffington Post, Vox and USA Today. Twitter has also tapped a number of celebrities to try out the app, including Aaron Paul, Mary J. Blige and Adam Shapiro. (Vanity Fair's digital director Mike Hogan received a short list of celebrities that have already set up accounts). Marketers and news organizations will likely use the app to show off live product demonstrations and events, said Dan Swenson, an art director at Huge. Like Sheffer, Swenson said he prefers Periscope. He said the desktop experience is better with full-screen video, and of course, the app has much bigger implications for marketers given Twitter's interest in video advertising. "The big thing will be if Twitter can have this integrated into their own app," he said. "That's going to be a huge thing, which I don't think Meerkat would have been able to do." Jill Sherman, Digitas' svp of social and content strategy, said the agency doesn't have any clients that have tested Meerkat or Periscope yet, but roughly half of its brands are interested in the apps. Though, she said, both apps have risks attached to them since there isn't a way to moderate comments or weed out spam. "We need to be able to control that for brands," Sherman said. Red Vines is one brand that seems ready to jump in with both feet when it comes to Periscope. "Integrating live-video broadcasting with Periscope reinforces Twitter's dominance as the primary social platform for consuming and publishing real-time content," contended Michael Kelley, digital lead for the candy's parent company, American Licorice. "Whether it's used for breaking news or sharing long-form video selfies from the beach, Periscope adds a valuable new utility that is a natural fit for the platform."